My loyal readers may remember that I made friends with another short-listed entrant for the 1st UK Blog Awards. He is Fletch the Perchcrow, who lives in the garden at Wordsworth’s House, Cockermouth. On a beautiful sunny day hubby and I went to see him again. 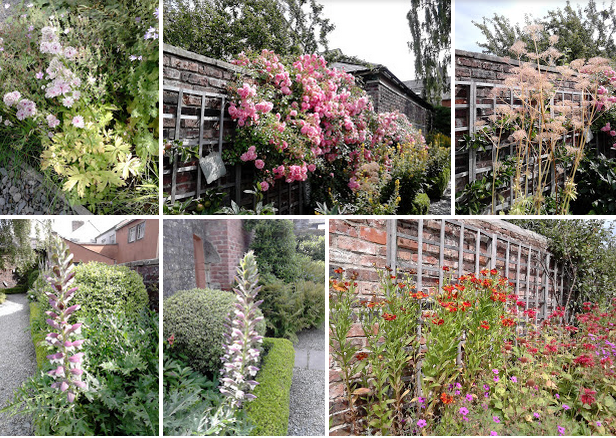 His garden is a riot of colour as you can see from the photos. We were surprised to find that he seemed totally unaware of a very pretty scarecrow the other side of a wall. I wonder what she is called. There were more bees than I have seen anywhere else this summer. They particularly liked a low plant with yellow leaves and white flowers, which has been planted around the edge of many of the flower beds. Yarn-bombers had been at work. This time some of the woolly items included sticks, making a framework. There were woolly insects too. Inside the house we were treated to a talk by one of the costumed servants. Fletch had mentioned the various activities on offer in the summer holidays. Life in Georgian England was very different from today. The staff and volunteers were friendly and helpful. It was interesting to consider how different some nearby places were in the past.